Maoyan Entertainment, China's largest online movie ticketing platform, is seeking a smaller-than-expected Hong Kong initial public offering of about US$300 million (HK$2.34 billion) amid a volatile financial market over the impact of the ongoing Sino-US trade war and the slowing growth of China's economy. Backed by mainland internet giants Tencent (0700) and Meituan Dianping (3690), as well as entertainment firm Beijing Enlight Media, Maoyan was initially tipped to be aiming to raise between US$500 million and US$1 billion in the float. In its latest IPO application with the Hong Kong stock exchange, the Beijing-based company also changed the name of its listing vehicle from Entertainment Plus. The core business of Maoyan is online entertainment ticketing services, which contributed 59.8 percent of total revenue from January to September last year. 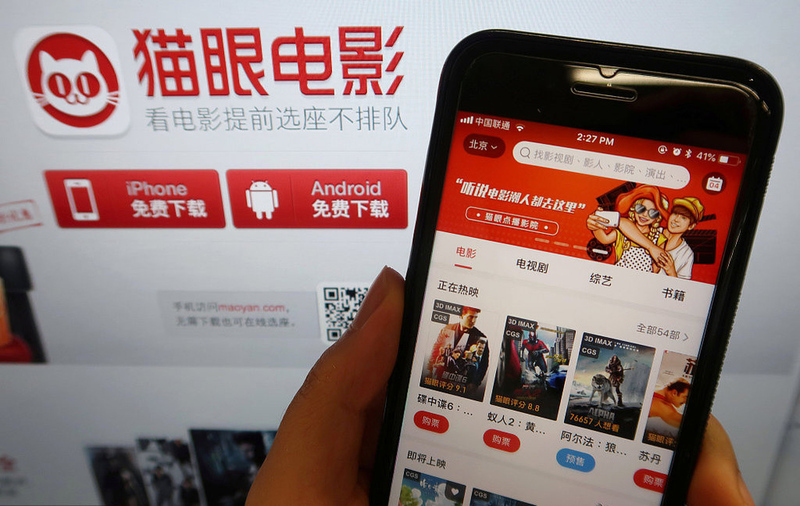 It is the largest online movie ticketing service provider in China with a market share of 61.3 percent, measured by gross merchandise volume of movie tickets sold in the first nine months last year. It ranks second in gross merchandise volume of entertainment events tickets, according to an iResearch Report. Maoyan's platform also offers in-venue food and beverage pre-ordering service, IP-derivative merchandise sales and advertising space for firms in the entertainment and other industries. It started its entertainment content services business in 2014 and now engages in distribution, promotion and production for movies, TV series, web series, web movies, variety shows and entertainment events. During a 21-month period up to last September, Maoyan was the largest distributor of domestic movies in terms of China gross box office revenue. It co-produced the smash hit, low-budget movie Dying to Survive which grossed 3.1 billion yuan (HK$3.59 billion), and it was the lead distributor and co-producer of blockbusters Never Say Die and Monster Hunt 2, which each grossed over 2.2 billion yuan. However, the company incurred losses in 17 movie productions as of last September. Between January to September last year, Maoyan grossed 910.2 million yuan from its entertainment content business, representing 29.8 percent of total revenue. It generated this revenue from promotional payments from movie production companies, distribution fees and its share of profit from movies. It has been questioned for conflict of interest as it plays the dual role of distributing movies and selling movie tickets at the same time. Us and Them, directed by Taiwanese singer and actress Rene Liu Jo-ying and co-produced by Maoyan, has been accused of ticket fraud after it grossed a record-breaking 280 million yuan on its first day of showing. After being reported widely in mainland media, Maoyan announced that as of 11pm at the opening day on April 28 last year, 380,000 tickets were refunded intentionally at its platform. The refund amounted to 13 million yuan and accounted for 4.6 percent of revenue from the first day of film showing. Maoyan's loss narrowed to 144 million yuan in January to September last year from a 152.1 million yuan loss during the same period a year earlier. It estimated a net loss of not more than 145.3 million yuan for the year ended December 31, 2018, the company said in its prospectus. It plans to use 30 percent of the net proceeds of its proposed listing to fund the enhancement of its integrated platform capabilities. Another 30 percent is earmarked for research and development, as well as technology infrastructure. Another 30 percent will be employed for potential investments and acquisitions, including its bid to take a minority stake in Huanxi Media, a mainland entertainment firm which has a strong roll-call of directors, including Zhang Yimou, Peter Chan Ho-sun, Wong Kar-wai, Ning Hao and Xu Zheng. Ten percent of its IPO proceeds will be used for working capital and for general corporate purposes. Hong Kong won the world's largest IPO market crown last year. New economy firms accounted for 62.65 percent of total funds raised, benefiting from listing reforms undertaken by the bourse operator Hong Kong Exchanges and Clearing (0388). However, the post-IPO performance of many listed firms failed to impress local investors. The dismal performance came even as scores priced their offerings more conservatively. Newly listed companies which raised more than US$100 million slashed 6.2 percent in their first month of trading on average, the worst return since 2008, according to a Bloomberg report.